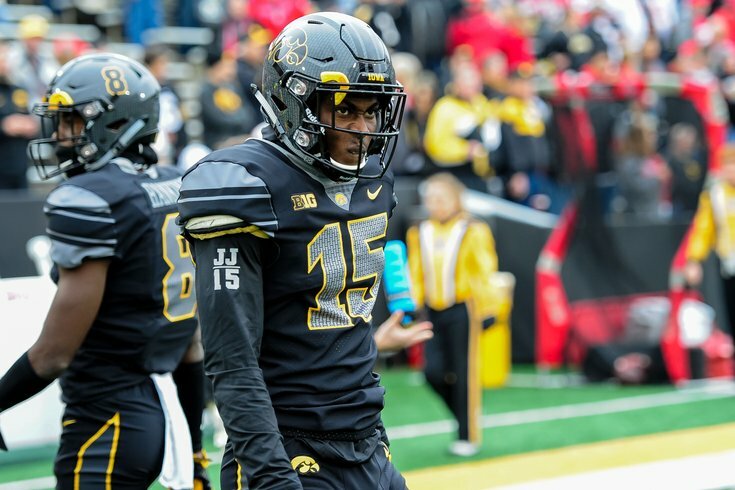 The NFL would be crazy to pay too much attention to Iowa CB Josh Jackson's shaky 40 time. The NFL Combine is a useful tool for player evaluation, and some teams put more stock in it than others. After his first draft with the Eagles last year, it would appear that Joe Douglas values on-field play over the "underwear Olympics." As we noted Sunday, Derek Barnett, Rasul Douglas, Donnel Pumphrey, Shelton Gibson, Nate Gerry, and Elijah Qualls all had disappointing Combines a season ago, and they all ended up on the Eagles' roster. This weekend we noted five "losers" from the Combine on offense who could be drafted by the Eagles at a bargain bin value as a result. Today, we'll note five players on defense. Previously, I had Settle as a potential first round target of the Eagles at pick No. 32. Settle's Combine certainly wasn't impressive, as in, he didn't help his cause much, but really, how high would one expect a 335-pound guy to jump? At Virginia Tech, Settle was a penetrating force, causing disruption in opposing backfields, and was a great run stuffer. In 2017, Settle had 36 tackles 4 sacks and 11.5 tackles for loss. Those aren't eye-popping numbers, but Settle's game tape is more impressive than his stats or his Combine numbers. If the Eagles traded back into the second round, I could see Settle being more of a value there. USA Today named Hurst as a Combine loser after he was revealed to have a heart condition. His combine was cut short after it was revealed he had been diagnosed with a heart condition, the severity of which is still unclear. The concern could be temporary, as former Utah defensive tackle Star Lotulelei had a similar experience in 2013 before being cleared at medical re-checks and being selected by the Panthers in the first round. Hurst will have to undergo the same evaluations, however, and he missed out on an opportunity to highlight his athleticism. We're really getting our money's worth on Hurst, as he was our first-round pick in our Eagles-only mock draft, version 1.0, so we have a cut-and-paste alert here. There's no earthly reason Hurst should be available at pick 32, but it has happened with undersized defensive tackles in the past. At 6'2, 280, Hurst is far from a prototypical defensive tackle. Geno Atkins fell all the way to the fourth round in 2010, and Aaron Donald to the 13th overall pick in 2014, despite being clearly more talented than many of the players taken before him. Now when you add on a potential heart condition, Hurst falling to the back of the first round is much more realistic. Obviously, any team interested in Hurst will have to do extensive tests on him, and Hurst will have to make sure he's not risking his own health by playing. But if he's well enough to play, and if he were to fall, Hurst would be an outstanding fit along the Eagles' penetrating defensive scheme, even with Fletcher Cox and Timmy Jernigan already occupying a big chunk of the Eagles' salary cap. The Eagles will likely need added depth with Beau Allen potentially leaving in free agency, especially considering their heavy rotation along the defensive line. Like Settle above, Brooks named Jewell as a Combine "loser." The instinctive tackling machine is an outstanding football player, but his disappointing workout highlighted his athletic limitations. Jewell posted a pedestrian 4.82-second 40-yard dash and didn't impress in change-of-direction drills. Although his game tape suggests he's a terrific player, it's hard to justify a high pick on an inside linebacker that runs slower than a 4.7-second 40. Jewell's bad Combine was as expected, as we noted back in December. Over the last three years, Jewell has been a tackling machine, racking up at least 120 tackles each season. He has also been something of a ball hawk, picking off 6 passes and forcing 3 fumbles over that same span. Despite his impressive numbers, Jewell is probably going to be available in the mid-to-late rounds, due to a lack of speed. As you can see in the video above, he won't exactly wow anyone running sideline to sideline. Still, he is an instinctive linebacker with special teams promise who could help the Eagles' linebacker depth. I like him in the fifth round to be a replacement for Joe Walker. John McClain of the Houston Chronicle listed Jackson as a Combine "loser." A ball hawk in college, he was projected to be the second player drafted at his position entering the combine, but his 4.56 40 will cause some teams to look closer at his tape. At 6-1, 191, he’s got excellent size, and he played faster at Iowa than he showed Monday. He needs to run faster at his pro day. The Eagles don't have much of a need for a cornerback, but if teams are scared off by Jackson's bad 40 time and he's available at pick No. 32, the Eagles should be ecstatic. Leading up to the Eagles-Vikings NFC Championship Game, we noted that the Eagles' defense was every bit as good as the Vikings' defense because of their ability to generate turnovers. Jackson was the best ball hawk in 2017, by far, in this cornerback class. Jackson led the country both in passes defensed (26) and interceptions (8). As you can see in the video above, Jackson is making plays, not benefiting by lucky interceptions. Cornerback is a position where an overabundance of depth isn't the worst thing. If there's a premier corner who fits your style of defense, just take him. McFadden's size is outstanding. His 40 time? Not so much. At the 2018 Combine, McFadden ran an awful 4.67 40. That was the second-worst time among all corners competing. In the 2017 NFL Draft, the Eagles drafted Rasul Douglas, who tied for the NCAA lead in interceptions in 2016, with 8. The player he tied with was McFadden. While McFadden had 8 picks in 2016, he had none in 2017. Coming out of high school, McFadden was a five-star recruit, but he struggled at times at FSU. While he produced a high number of turnovers in 2017, he also gave up five touchdowns that season, and there are additional concerns about his willingness to tackle. Still, it's clear that he has great ball skills, and he's very effective in press coverage at the line of scrimmage. Again, the Eagles don't have a huge need for corners, but if McFadden somehow fell to the fourth round (I doubt that happens), the Eagles would be wise to snap him up.